In an insane act of violence two people lost their lives in Basirhat (West Bengal, 04 07 2017). From last quite some time the social media is abuzz that WB is turning Islamist, Hindus are under great threat, their condition is becoming like that of Pundits in Kashmir. The section of TV media projected the view that WB is not safe for Hindus but is a heaven for Muslims. Angry posts are also declaring that Mamata is appeasing Muslims, Islamist Radicals are growing in Bengal with support from the Mamata Government etc. BJP leaders got hyperactive and visited the area as a delegation. They tried to enter the hospital to see the dead body of Kartik Chandra Ghosh (Age 65). Muslim attackers had killed him. This attempt of the BJP leaders was to derive political mileage from the situation as BJP claimed that Ghosh was President of one of the units of BJP, while Ghosh’s son denied it. The Governor of West Bengal, K.N. Tripathi, reprimanded Mamata Bannerjee for the violence. Seeing his attitude Mamata got upset and called him as the one belonging to BJP block level leader. Same Governor has been called as a ‘dedicated soldier of Modi Vahini’ by one BJP leader Rahul Sinha. 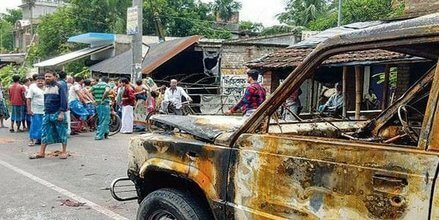 The communal violence has taken a political color, BJP accusing chief minister Mamata Banerjee of appeasement of Muslims while the ruling Trinamool Congress is alleging that BJP is out for inciting communal passions to benefit electorally. Surprisingly with this violence, where two people have lost their life, BJP is demanding the President’s rule in the state, while the law and order has already been restored within a week’s time. The picture in Bengal is very complex. A section of Muslim leadership is repeatedly doing violence in response to ‘hurt sentiments’. Earlier also violence was unleashed by Muslims in Kaliachak, when one Kamlesh Tiwari had posted something offensive against Prophet Mohammad. The feeling of impunity enjoyed by this section of Muslim leadership is giving a big handle in the hands of Hindutva forces, for which this yet again is opportunity to polarize the society along religious lines. Here in Bengal they don’t have to create the issue of ‘Holy Cow’ or ‘Ram Temple’, it is being provided by this misguided section of Muslim leadership. The picture is being created that Bengal is in the grip of Islamization as earlier Kaliachak violence and now this violence are being cited to show that Hindus are unsafe here. There was no loss of life in Kaliachak incident but yes there was loss of property, though. The core theme of BJP-RSS propaganda is built around Hindu victimization. The role of government has been far from satisfactory in this violence, as it had time enough to control the situation but it did not. The law and order machinery must ensure prevention of the buildup of such incidents. By and large one can say that effective system can prevent most of the riots, irrespective of who is the offender. Here the Government should have acted in time. Surely, Mamata’s alleged appeasement of Muslims does not apply in economic matters. The fact is that the economic conditions of Muslims of Bengal are among the worst in the country. The budgetary allocation for minorities in Bengal is much less than in many other states. At the same time the communal polarization by the BJP is coming up with the menacing speed. In a state where Ram Navami (Lord Ram’s birth day celebration) was practically unheard of, this year around the Ram Navami procession was taken out with frightening swords in hands. Lord Ganesh festival is also being promoted in the state where Ma Durga had been the main deity so far. Finally, who benefits from the violence? The studies of different scholars on communal violence in India like those by Paul Brass point out that there is an institutional riot mechanism, the core part of which is the impunity enjoyed by the offenders, the abysmal role of justice delivery system as a whole. Another significant study from Yale University tells us that in the places where communal violence takes place, in the long run at electoral level, it is BJP which stands to benefit. Those who appease the Muslim fundamentalists should note this and see to it that that, to discharge the constitutionally assigned duties are the essence of governance, irrespective of the community involved in the violence. Let’s summarize the anatomy of violence in Bashirghat. Stage one, the offensive post on face book, two fundamentalist radical sections of Muslims unleash violence, number three the approach of the state government fails in preventing the violence. Number four BJP carries on from there and worsens the atmosphere by playing out videos which showed that Muslims were attacking Hindus in Basirhat. It turned out that videos were not from Bashirhat at all. They were taken from Gujarat violence of 2002. Also clips of a Bhojpuri films showing the molestation of Hindu women were recklessly circulated, the impression being given that this is happening in Basirhat. The same was claimed by BJP’s national general secretary Kailash Vijayvargiya, who said that he had news of Hindu women being raped in the affected area. And lastly drums are beaten about victimization of Hindus in Bengal. One just hopes it will not lead to polarization of communities leading in a state where so far communal violence had been reasonably under check.